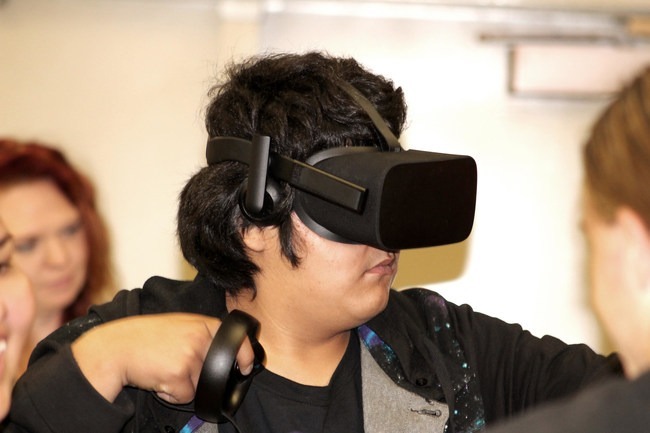 A virtual reality (VR) and coding academy is coming to Whitehorse High School on the Navajo Nation reservation. Principal Kim Schaefer hopes the VR initiative will prepare a new generation of Navajo students for entrepreneurship or successful careers—without needing to leave their families and reservation community. One third of the Navajo population is under 18, according to the most recent U.S. Census 2000. Indigo Impact Initiative (I3), a Colorado-based nonprofit providing at-risk youth with mentorship in technology and entrepreneurship, has partnered with two high-tech companies—Lobaki Inc. and ClearCenter Inc.—to start a virtual reality and coding academy at Whitehorse. Throughout the courses, students will get hands-on experience in storyboarding, app development, networking, design and programming. “Bringing Virtual Reality and programming tools into our district will create generations of students with new and marketable skills,” said Aaron Brewer, Director of Technology for San Juan School District. The VR centers are being set up and managed by Lobaki, a social enterprise from Jackson, MS. Spending on VR globally is currently greater than $13 billion, and is expected to significantly increase in the next decade, with career opportunities spiking as a result. Scholars who graduate Whitehorse’s VR certification program with distinction have opportunities to be hired by Lobaki and other corporations to work on commercial projects, creating jobs on the reservation. Indigo is also leading an entrepreneurship certification course to help Navajo students build the skills needed to start a company from scratch. Students participating in the program will work with the Utah Offices of Economic Development and the Navajo Regional Business Development Offices to turn their projects into successful local businesses. Whitehorse High School was awarded a Talent Ready Utah grant from the Department of Workforce Services for the project. I3 has been working with the school district since 2016 through the support of Target Training International and the San Juan Foundation.